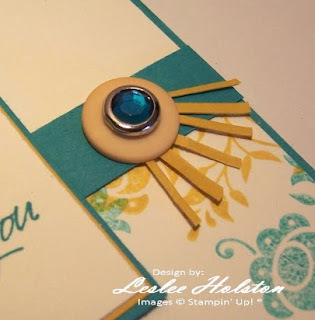 Leslee's Creative Inspiration: Finally....some Razzle Dazzle! Admittedly, my Razzle Dazzle set has not seen much ink. I've had a difficult time with what to do with it. I'll set it in front of me and stare at it blankly. Just hoping that some sort of inspiration will well up in me...it just hasn't. All that changed. 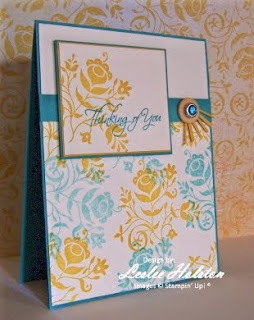 I was playing 'sketch up' and came across the Fall-to Layout #55 over at the Clean & Simple Stamping blog. It was the Razzle Dazzle inspiration that I've been waiting for! I took one look at that layout and knew immediately what set I would use! Yes! Finally! And I love the way the card turned out! There was a slight requirement for this sketch...the bottom panel is to feature some DIY stamped paper and the sentiment panel feature a coordinating image. Thanks for taking a look. Inspiration can come from many places! We just need to open our minds to see it.